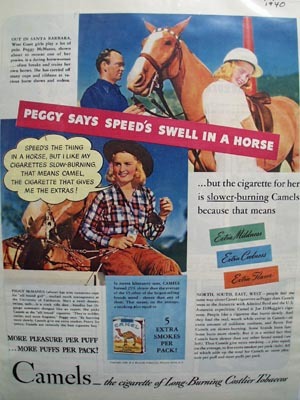 Camels & Peggy McManus With Horse Ad 1940 This is an April 9, 1940 advertisement It is a nice color ad from Camel Cigarettes, It pictures Peggy McManus of Santa Barbara daring horsewoman. Peggy says speed's swell in a horse but she likes her cigarettes slow-burning. In mint condition. Photo is taken through plastic and may show wrinkles or crookedness that is not in the ad. This magazine tear sheet measures 10 1/4"" wide by 13 1/4"" tall. Items Similar To "Camels & Peggy McManus With Horse Ad 1940"